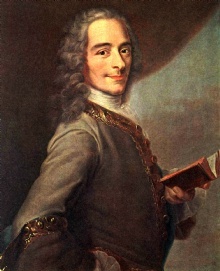 Voltaire was a famous Writer from France, who lived between November 21, 1694 and May 30, 1778. He became 83 years old. Voltaire was a prolific writer and wrote works in nearly every literary form and genres, including plays, poetry, novels, essays, historical and scientific works, more than 20,000 letters and more than 2,000 books and pamphlets. He was outspoken advocate of social reforms, despite the censorship laws and harsh penalties for those who broke the law. As a satirical polemicist, he frequently used his writings and books to criticize the Catholic Church dogma and the French institutions of his time. He was a leading representative of Deism, a thinking that claimed that there is a God who created everything, but do not rule the world. Voltaire was one of several famous writers during the Enlightenment, together with the Charles Montesquieu, John Locke and Jean-Jacques Rousseau, who influenced other significant thinkers who in turn had influence on both the French as the American Revolution. He is born under the zodiac scorpio, who is known for Transient, Self-Willed, Purposeful, Unyielding. Our collection contains 131 quotes who is written / told by Voltaire, under the main topics: Motivational, Age, Birthday, Faith, Intelligence. "To succeed in the world it is not enough to be stupid, you must also be well-mannered"
"We have a natural right to make use of our pens as of our tongue, at our peril, risk and hazard"
"He was a great patriot, a humanitarian, a loyal friend; provided, of course, he really is dead"
"It is one of the superstitions of the human mind to have imagined that virginity could be a virtue"
"The flowery style is not unsuitable to public speeches or addresses, which amount only to compliment. The lighter beauties are in their place when there is nothing more solid to say; but the flowery style ought to be banished from a pleading, a sermon, or a didactic work"
"He must be very ignorant for he answers every question he is asked"
"The truths of religion are never so well understood as by those who have lost the power of reason"
"There are truths which are not for all men, nor for all times"
"Clever tyrants are never punished"
"The husband who decides to surprise his wife is often very much surprised himself"
"The very impossibility in which I find myself to prove that God is not, discovers to me his existence"
"Let us read and let us dance - two amusements that will never do any harm to the world"
"The Holy Roman Empire is neither Holy, nor Roman, nor an Empire"
"Life is thickly sown with thorns, and I know no other remedy than to pass quickly through them. The longer we dwell on our misfortunes, the greater is their power to harm us"
"This self-love is the instrument of our preservation; it resembles the provision for the perpetuity of mankind: it is necessary, it is dear to us, it gives us pleasure, and we must conceal it"
"We must cultivate our own garden. When man was put in the garden of Eden he was put there so that he should work, which proves that man was not born to rest"
"It is not sufficient to see and to know the beauty of a work. We must feel and be affected by it"
"We cannot always oblige; but we can always speak obligingly"
"The first step, my son, which one makes in the world, is the one on which depends the rest of our days"
"Weakness on both sides is, as we know, the motto of all quarrels"
"Of all religions, the Christian should of course inspire the most tolerance, but until now Christians have been the most intolerant of all men"
"The true triumph of reason is that it enables us to get along with those who do not possess it"
"God is a comedian, playing to an audience too afraid to laugh"
"All the reasonings of men are not worth one sentiment of women"
"When it is a question of money, everybody is of the same religion"
"Anyone who has the power to make you believe absurdities has the power to make you commit injustices"
"To the living we owe respect, but to the dead we owe only the truth"
"The secret of being a bore... is to tell everything"
"The mouth obeys poorly when the heart murmurs"
"Never argue at the dinner table, for the one who is not hungry always gets the best of the argument"
"No problem can withstand the assault of sustained thinking"
"Prejudices are what fools use for reason"
"Satire lies about literary men while they live and eulogy lies about them when they die"
"Stand upright, speak thy thoughts, declare The truth thou hast, that all may share; Be bold, proclaim it everywhere: They only live who dare"
"The art of government is to make two-thirds of a nation pay all it possibly can pay for the benefit of the other third"
"The infinitely little have a pride infinitely great"
"The instruction we find in books is like fire. We fetch it from our neighbours, kindle it at home, communicate it to others, and it becomes the property of all"
"The opportunity for doing mischief is found a hundred times a day, and of doing good once in a year"
"Fear follows crime and is its punishment"
"Friendship is the marriage of the soul, and this marriage is liable to divorce"
"Each player must accept the cards life deals him or her: but once they are in hand, he or she alone must decide how to play the cards in order to win the game"
"Every one goes astray, but the least imprudent are they who repent the soonest"
"I hate women because they always know where things are"
"How pleasant it is for a father to sit at his child's board. It is like an aged man reclining under the shadow of an oak which he has planted"
"I have never made but one prayer to God, a very short one: "O Lord make my enemies ridiculous." And God granted it"
"I should like to lie at your feet and die in your arms"
"It is not enough to conquer; one must learn to seduce"
"Is there anyone so wise as to learn by the experience of others?" "It is an infantile superstition of the human spirit that virginity would be thought a virtue and not the barrier that separates ignorance from knowledge"
"It is better to risk saving a guilty man than to condemn an innocent one"
"It is dangerous to be right in matters on which the established authorities are wrong"
"Men hate the individual whom they call avaricious only because nothing can be gained from him"
"Men use thought only as authority for their injustice, and employ speech only to conceal their thoughts"
"My life is a struggle"
"Nature has always had more force than education"
"Meditation is the dissolution of thoughts in Eternal awareness or Pure consciousness without objectification, knowing without thinking, merging finitude in infinity"
"Doubt is not a pleasant condition, but certainty is absurd"
"It is difficult to free fools from the chains they revere"
"It is not known precisely where angels dwell whether in the air, the void, or the planets. It has not been God's pleasure that we should be informed of their abode"
"It is not love that should be depicted as blind, but self-love"
"Ice-cream is exquisite - what a pity it isn't illegal"
"I know many books which have bored their readers, but I know of none which has done real evil"
"I am very fond of truth, but not at all of martyrdom"
"I have lived eighty years of life and know nothing for it, but to be resigned and tell myself that flies are born to be eaten by spiders and man to be devoured by sorrow"
"Faith consists in believing when it is beyond the power of reason to believe"
"Froth at the top, dregs at bottom, but the middle excellent"
"History should be written as philosophy"
"The progress of rivers to the ocean is not so rapid as that of man to error"
"The public is a ferocious beast; one must either chain it or flee from it"
"The safest course is to do nothing against one's conscience. With this secret, we can enjoy life and have no fear from death"
"The little may contrast with the great, in painting, but cannot be said to be contrary to it. Oppositions of colors contrast; but there are also colors contrary to each other, that is, which produce an ill effect because they shock the eye when brought very near it"
"The ancient Romans built their greatest masterpieces of architecture, their amphitheaters, for wild beasts to fight in"
"The ancients recommended us to sacrifice to the Graces, but Milton sacrificed to the Devil"
"Superstition is to religion what astrology is to astronomy the mad daughter of a wise mother. These daughters have too long dominated the earth"
"Society therefore is an ancient as the world"
"Very learned women are to be found, in the same manner as female warriors; but they are seldom or ever inventors"
"Very often, say what you will, a knave is only a fool"
"What is tolerance? It is the consequence of humanity. We are all formed of frailty and error; let us pardon reciprocally each other's folly - that is the first law of nature"
"The multitude of books is making us ignorant"
"What then do you call your soul? What idea have you of it? You cannot of yourselves, without revelation, admit the existence within you of anything but a power unknown to you of feeling and thinking"
"When he to whom one speaks does not understand, and he who speaks himself does not understand, that is metaphysics"
"Time, which alone makes the reputation of men, ends by making their defects respectable"
"To believe in God is impossible not to believe in Him is absurd"
"To the wicked, everything serves as pretext"
"Tyrants have always some slight shade of virtue; they support the laws before destroying them"
"Anyone who seeks to destroy the passions instead of controlling them is trying to play the angel"
"Anything that is too stupid to be spoken is sung"
"As long as people believe in absurdities they will continue to commit atrocities"
"Whoever serves his country well has no need of ancestors"
"Woe to the makers of literal translations, who by rendering every word weaken the meaning! It is indeed by so doing that we can say the letter kills and the spirit gives life"
"All men are born with a nose and ten fingers, but no one was born with a knowledge of God"
"All murderers are punished unless they kill in large numbers and to the sound of trumpets"
"All styles are good except the tiresome kind"
"An ideal form of government is democracy tempered with assassination"
"Divorce is probably of nearly the same date as marriage. I believe, however, that marriage is some weeks the more ancient"
"Business is the salt of life"
"By appreciation, we make excellence in others our own property"
"Chance is a word void of sense; nothing can exist without a cause"
"One merit of poetry few persons will deny: it says more and in fewer words than prose"
"In every author let us distinguish the man from his works"
"Indeed, history is nothing more than a tableau of crimes and misfortunes"
"Love has features which pierce all hearts, he wears a bandage which conceals the faults of those beloved. He has wings, he comes quickly and flies away the same"
"In general, the art of government consists of taking as much money as possible from one class of citizens to give to another"
"Originality is nothing but judicious imitation. The most original writers borrowed one from another"
"We cannot wish for that we know not"
"The sovereign is called a tyrant who knows no laws but his caprice"
"Let us work without theorizing, tis the only way to make life endurable"